Even at 35 years of age, Michael Carrick's importance to this side cannot be overstated. United are undoubtedly a better side with the calmness, composure and class of Carrick sitting at the base of midfield - we as fans know it, Jose knows it and, crucially, Paul Pogba knows it too. Like a fine wine, he just seems to get better with age. We've won all six games that Carrick has played in this term (Leicester, Northampton, Fener, City in the Cup and Swansea with a 12 minute cameo against the Foxes in the league with the game already won). Mourinho looks and sounds like a man who wants to play Carrick on a more regular basis but - understandably - is wary of his age and wants to manage his game time. He cannot play every game but has to be involved more often. He brings stability, composure and gives licence to those around him to roam forward with freedom. Pogba has been the player to benefit most from the 35-year-old's presence in the team. He seems more at ease on the ball and breaks the shackles when driving from deep safe in the knowledge that he's got Carrick as a shield if needed. 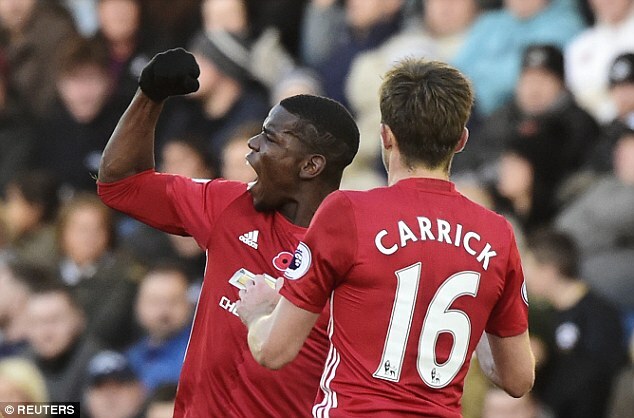 Pogba's goal at Swansea was a goal of the season contender and he does appear freer- and more confident- with Carrick alongside. At the weekend, Pogba flourished in an attacking role and looked unburdened by all that has weighed him down since making the world record move back to United in the summer. It was the same in the Europa League match at home to Fenerbahce last month when the Frenchman scored a belter from distance in a man of the match display. The common denominator? Carrick played. In terms of his true footballing talents he's nothing exceptional: safe, simple, limited mobility wise and rarely offers anything going forward. It is what he brings to his team-mates that makes him so indispensable - he makes others around him better and what he lacks in pace and power he makes up for in intelligence, accuracy and vision. He rarely wastes a pass (his completion rate is always up in the 90s), shields the back four effortlessly and his decision making is sharper and quicker than anyone else in the team. Jose has a better squad at his disposal than has been recently recognised but he must find a way to get much more out of them and Carrick - more than any other player - is the man who can help him do that.